This week has been an epic week. This week was when months of plotting and planning came together. This week was when I felt nerves like I haven’t felt in years. This week I launched my new business. 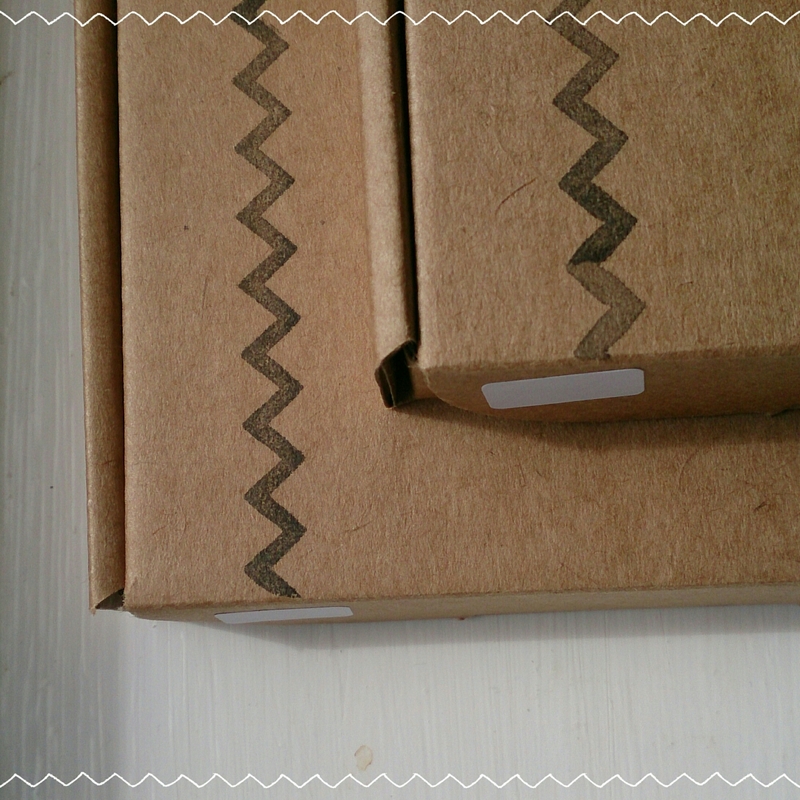 This week I sold some of my boxes! 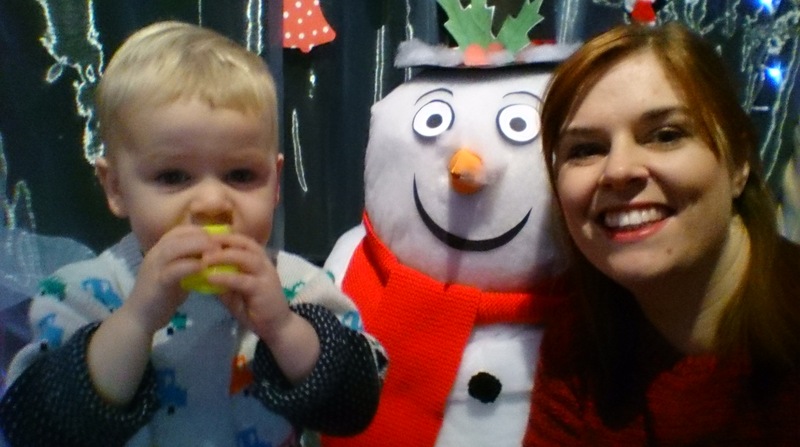 This week I (hopefully) passed on some crafty activities and inspiration to the parents of under 3s. This week will hopefully be the start of something new. I can’t believe we’re ending March so soon, and I must admit that between work, launching my new business, hubby sitting what is hopefully his penultimate exam and we’ve started to think about moving house there’s not been a lot of time to just stop and be still or reflect. But I must also admit that I have been missing the blogging community a little recently. I’m so excited for many people who have been announcing their second pregnancies recently online and wanted to share a little bit of what we’ve been doing this month. 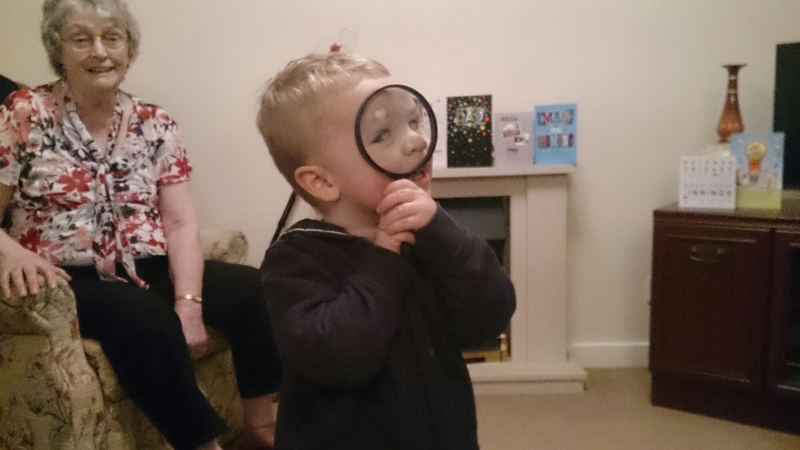 Inspector Sprog playing at my Grandparents house. They love seeing him grow so much and it’s incredibly rewarding to be able to see the love between them all grow. 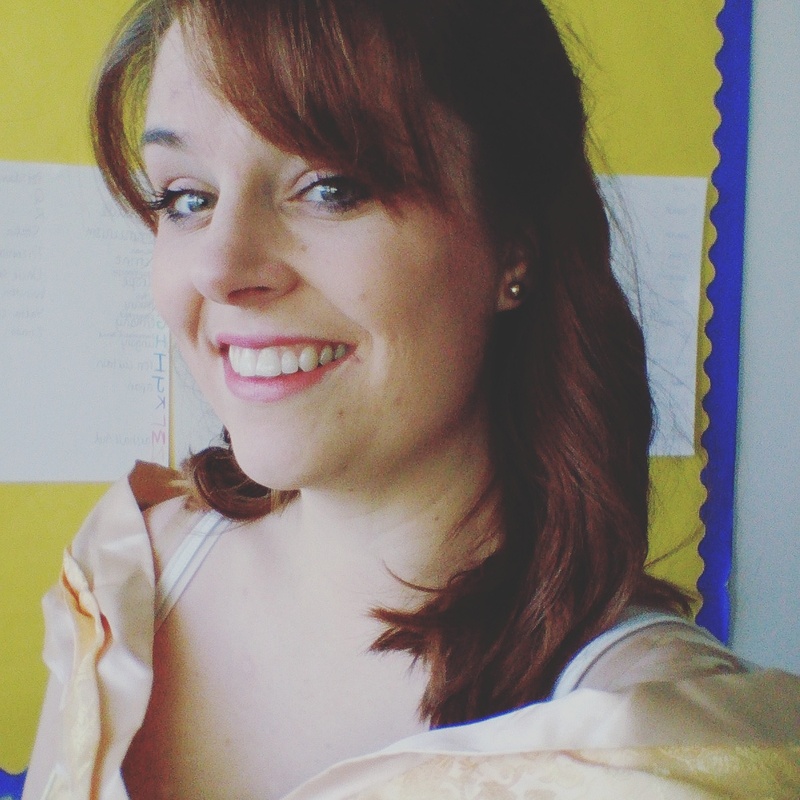 World Book Day/Dress up day/Dress like a princess to go to work day – I blooming loved dressing as Belle for the day and the kids at school were amazed by my commitment to dressing up! A little example of Sprog’s handiwork – they’ve been busy at nursery recently with Easter, Mothers Day and St Patricks day (!!!) all meaning a beautiful piece of nursery art coming home. On Mother’s Day, Sprog and I actually did escape for some time together as hubby was busy studying for an exam. 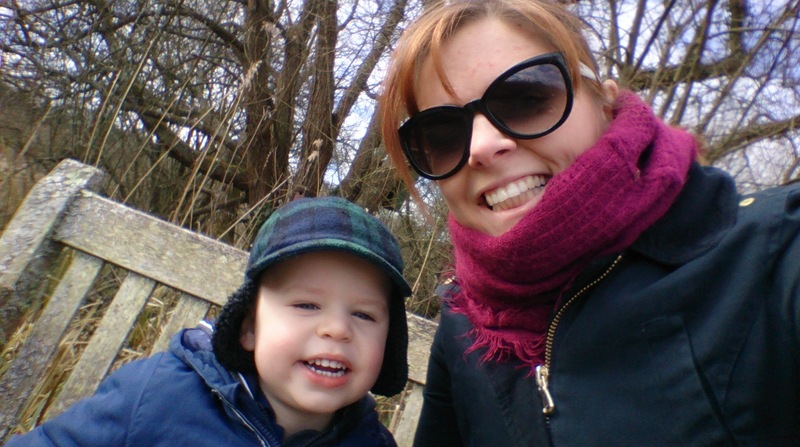 We went to one of our favourite hangouts, the WWT at Arundel, and Sprog shouted at the ducks the whole way round. 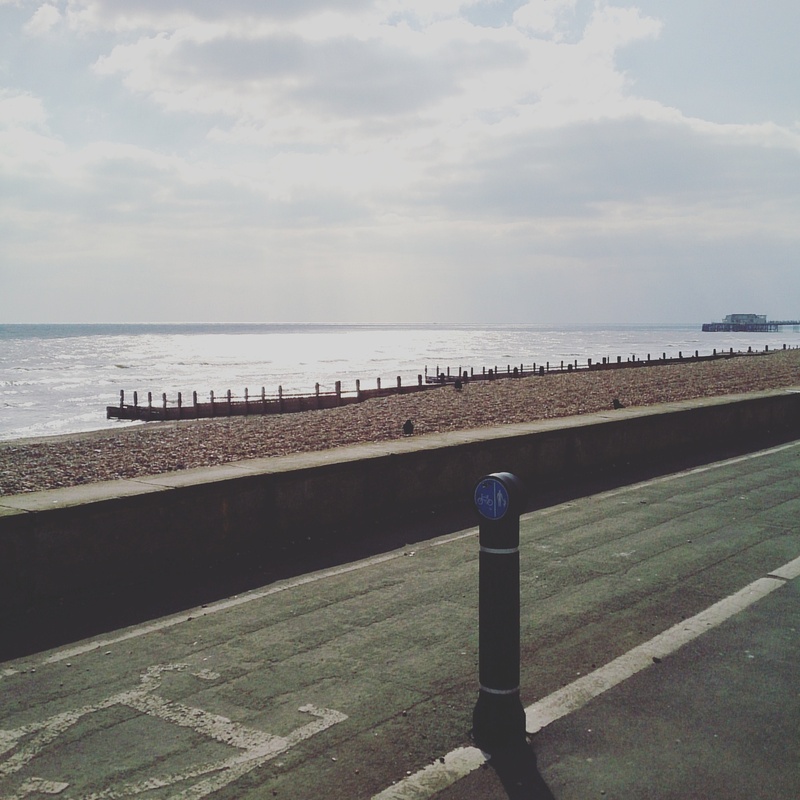 I have discovered this month that I can get to the seafront, have a 5 minute walk on the beach, and get back to school in my lunch time. It won’t be an every day occurrence but it’s great for when I just need to get some air and get out of the building at lunch. 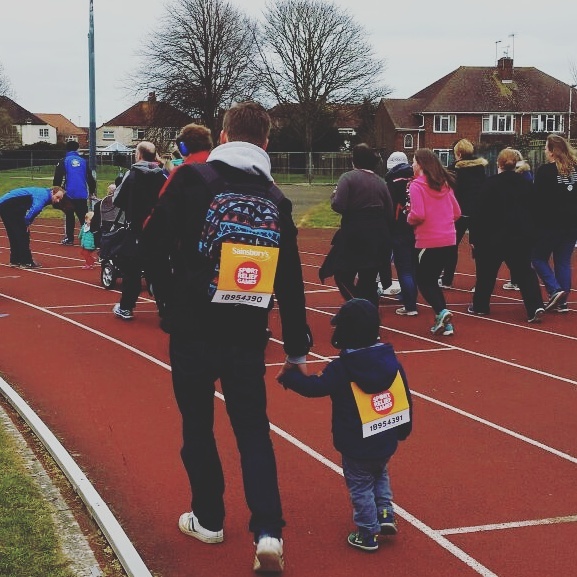 As a family, we completed the Sport Relief mile. I ran, almost all the way (I’m blaming the freezing cold air). Sprog walked the first 100 meters before realising that I had run off and demanding to be carried the rest of way…God bless the hubby for all that carrying! 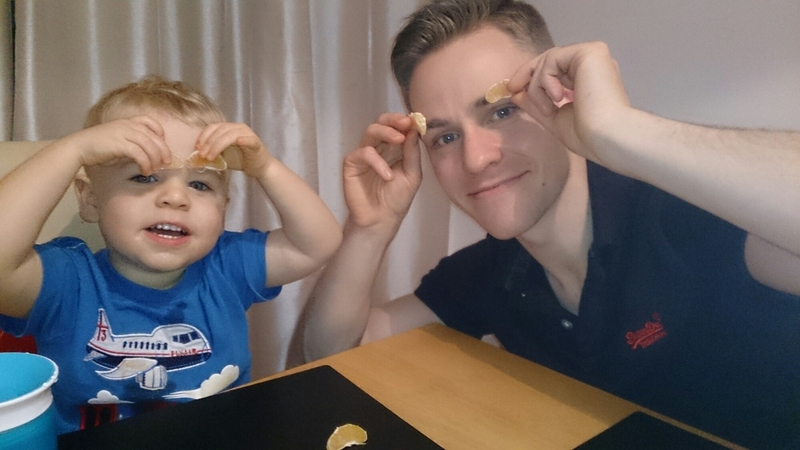 And this is the big one, the huge deal, the momentous stage of parenting…toilet training! We’re on Day 5 today…we’re getting there with a mixture of super duper praise and a few stickers. I am just so proud of how Sprog is picking this up and whilst he has not been the total miracle that I wished he would be (I was hoping for the whole thing to be sorted in a day! ), he has been pretty darn spectacular! It’s a funny old feeling to be starting something new, to really be putting myself out there. Regular followers will know that for a while I have been toying with my future in teaching and what I might do instead. I am not announcing my withdrawal from the profession at the moment. I have found what I hoped for which is that my new school has given me space. Space for my family and space for me! So here’s sone teasers as to what I’ve been up to. 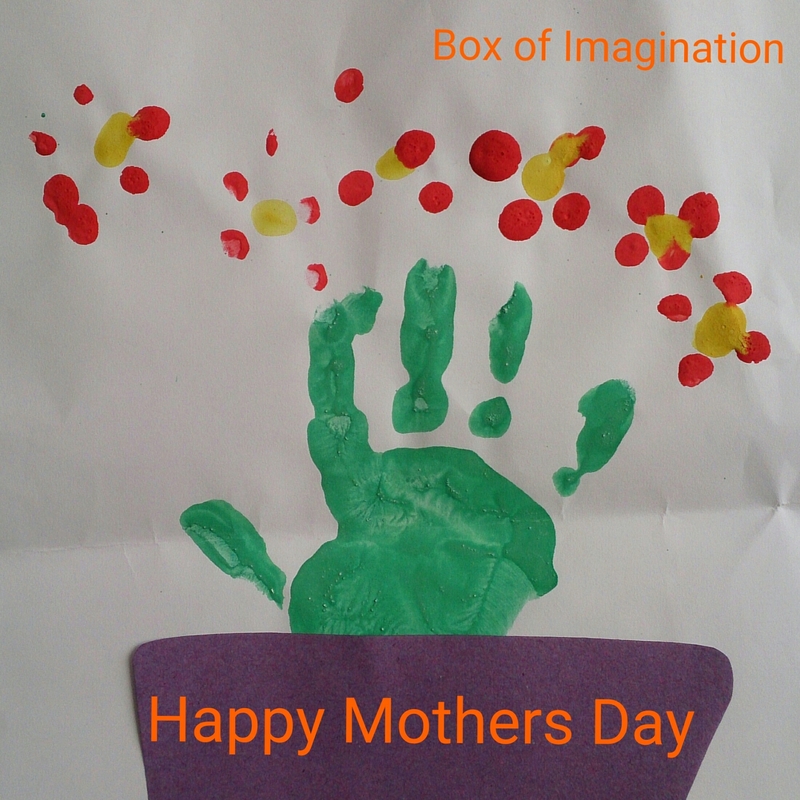 I am launching my new business Box of Imagination at the start of April from the Pregnancy and Family Fair at a local nursery. 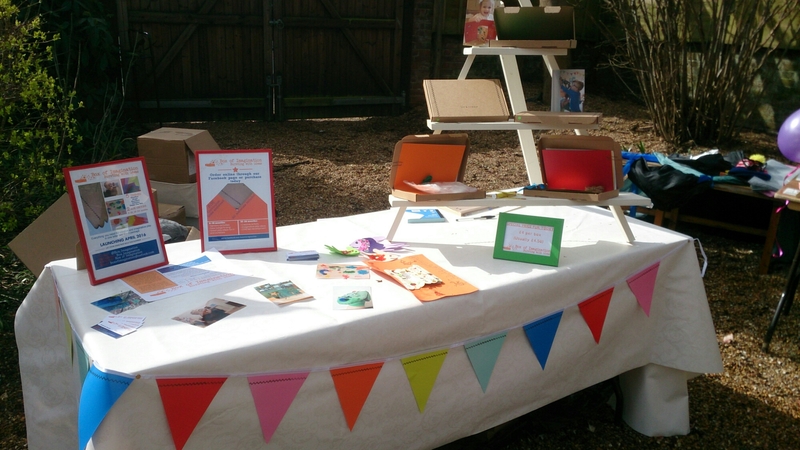 The fair itself is a fabulous idea as it is raising money for MIND and will offer free entry to parents with lots of exhibitors showing brilliant ideas for expectant parents and families with children under the age of 5. 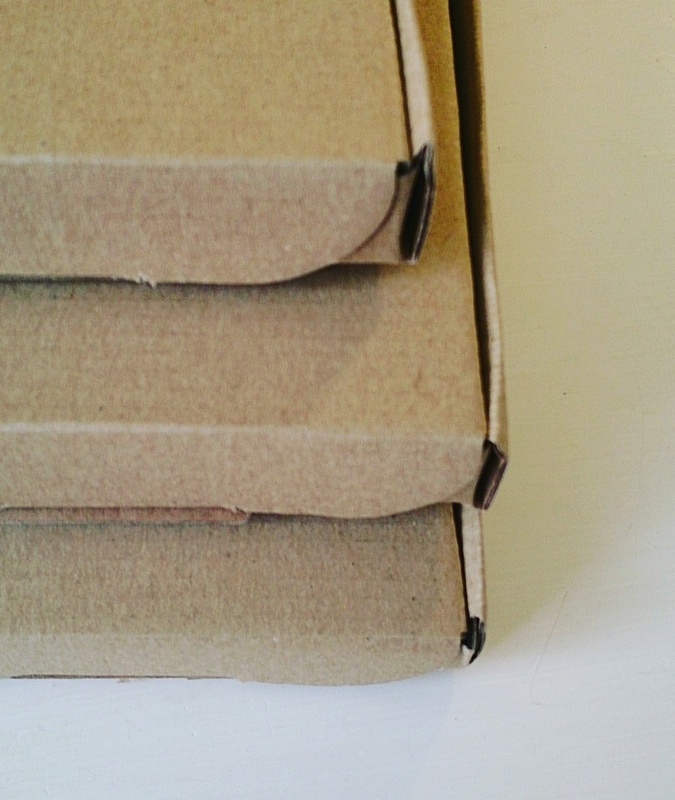 I will be selling my little boxes for the first time ever! This is a range of imaginative play opportunities and ideas, along with a creative activity with all the materials needed to make the piece. There are 5 themed boxes to launch with; Weather, Magic, Vehicles, Under the Sea and Monsters. Each theme is available in a 6-18 month old or 18-36 month old option. 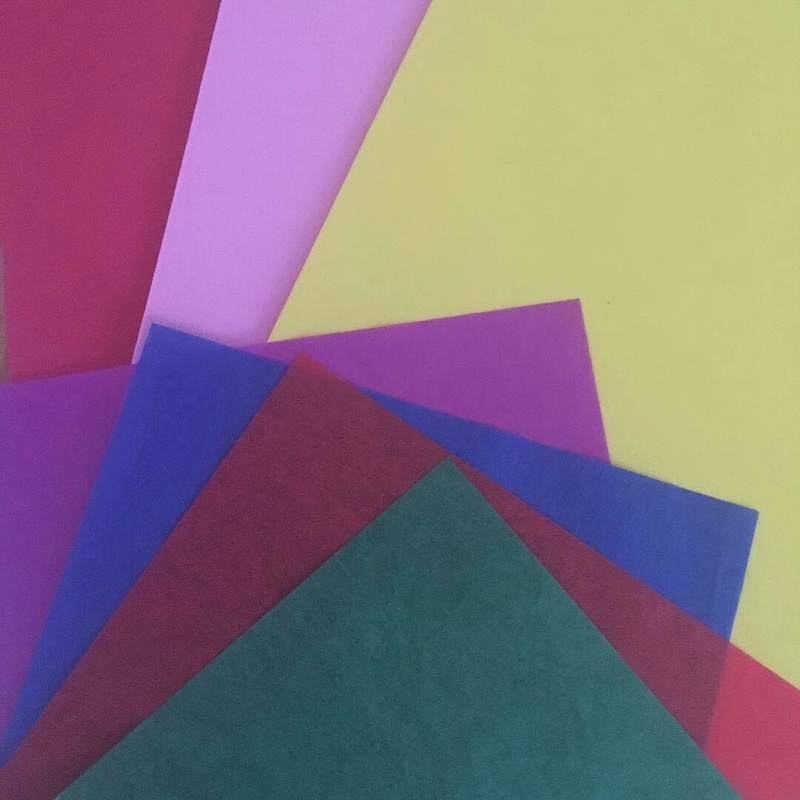 Each box is designed in a way that the child will be able to interact with the materials and depending on their developmental stage, participate in creating the craft activity. 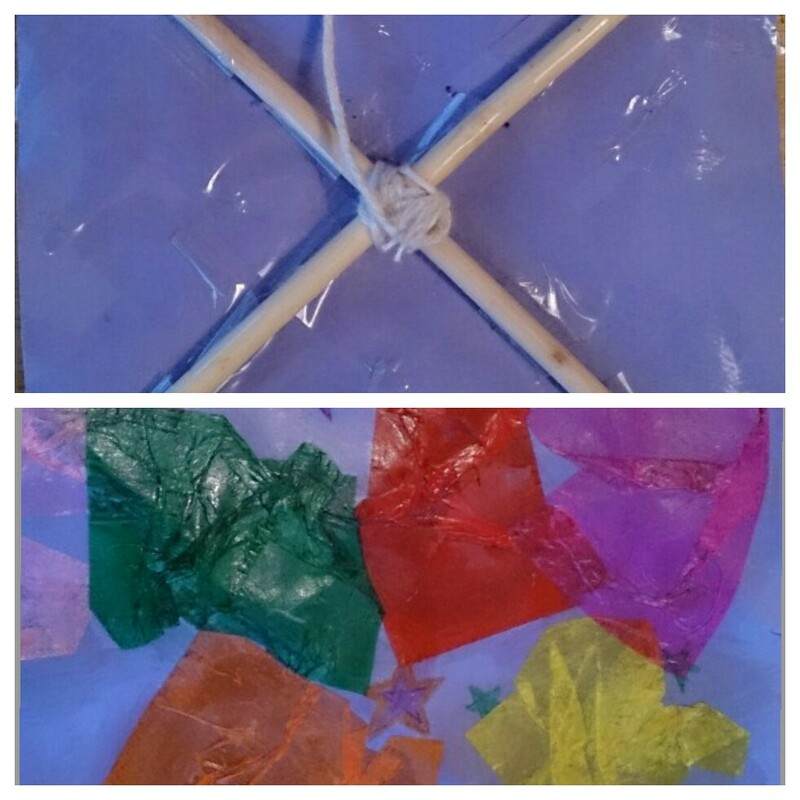 I am passionate that children should be given the chance to lead their learning and progression so the activities are all designed with this in mind and with an explanation of the links to the EYFS curriculum. When we launch, the boxes will be available to purchase from our Facebook page, and you can get updates from our Twitter and Instagram accounts. I have been wanting to do this for ages. When better than a rainy Sunday afternoon when hubby had popped out for a bit so I could set it up without judgement?! He’s not a fan of the messy play! – Enjoy yourselves… I ended up with paint all over my legs but we laughed so much! 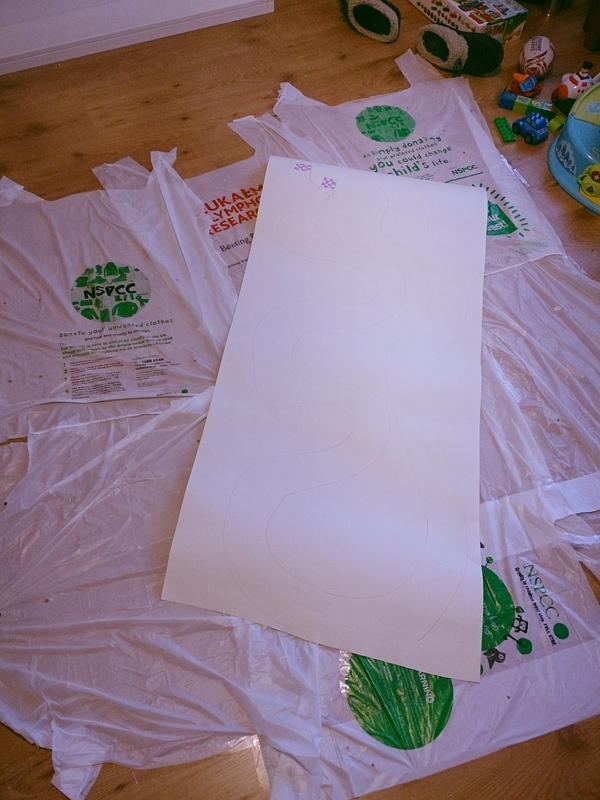 Set out your sheet of paper and draw a track. We used some leftover wall paper. Make sure that the plastic you use completely covers the floor…this bit we did well. I use the plentiful supply of charity bags that we get through the door. Dip cars in paint and get racing! We loved looking at the different patterns, driving through paint puddles and driving up each others legs! After we’d finished playing with the cars, we headed upstairs to the car wash (the bath), where we very quickly turned the water red but Sprog was chief car washer and was in charge of the sponge to wash them down. All in all Sprog and I both ruddy loved doing this! 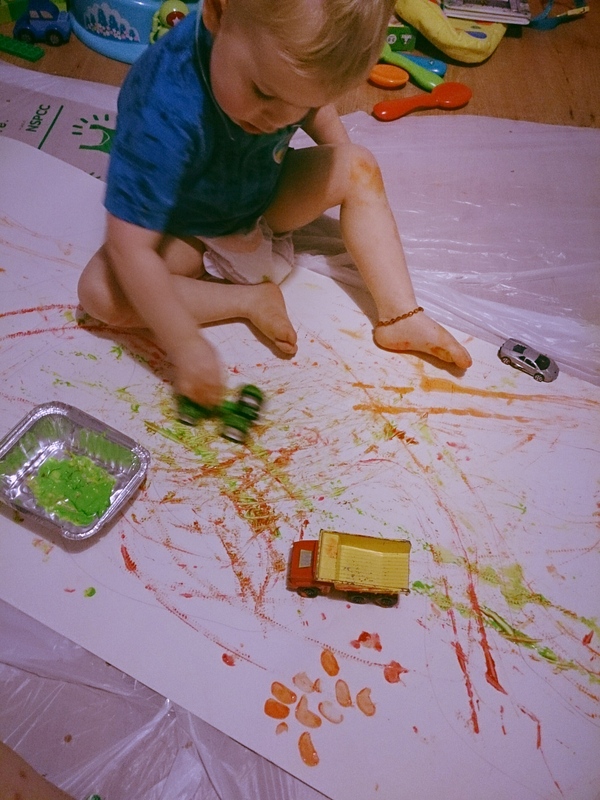 I’d love to know what your favourite messy play is for some inspiration! 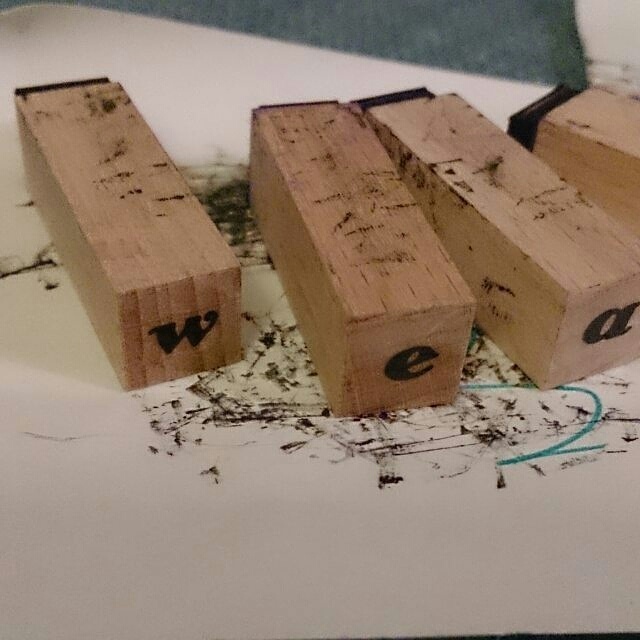 If you’re interested in our other crafting activities, pop over to the Crafting page. My last blog post was on 11th November 2015, it is now 1st December 2015. In the blogging world that is an eternity. I may as well have stopped altogether. I hope there aren’t too many heartbroken souls who have been mourning their lack of Sprog spam… None of you have said anything if you are. The reality for me is that for the last 3 weeks, I’ve pretty much spent every evening marking mock exams, refusing to mark mock exams and needing time to chill out, or plotting my future career plans (sorry, this shall remain a tightly guarded secret). The reality for me is that I’ve not wanted to write. Not because anything negative has happened but because it’s just not been my priority and that’s fine with me. The reality is that I don’t know if I’m going to continue blogging. However, it has felt lovely to even write this little post about how I’m feeling and what’s going on. In my dream world, I’d have time to write, time to do massively fun activities with Sprog all the time and then write them up, I’d get the big freebie days out or holidays given out by PR guru’s. In my dream world, I’d get to spend far more time with Sprog whilst working in a role that stimulated my love for teaching but without the beaucracy and politics of working within a school setting. Until this summer, I had loved blogging, the connections I had made and the community which surrounds it and I cannot thank this little online world enough for pulling me through the first couple of years of parenting as I started blogging to help find my way through the minefield when I was the first of my friends to have a small person. And fellow bloggers, whether I have time to comment or not, I am still following many of you and wish you all the best. It’s been odd watching my stats tick along with a few hits each day without any effort, the days of triple digit views are well over but then I remember the number of blogs I was reading each day. When I don’t stop marking until 10 p.m. or later, I don’t really have the willpower to stay awake and comment on other blogs too. 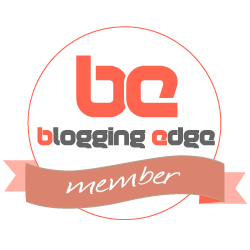 I think I still love the idea of blogging and may well come back to it. I’m definitely not closing up shop entirely and have a potential business plan that may well seem me reaching out to a few blogger friends in the hopefully not too distant future…you never know, I could soon be back in your lives but in a much different way! I’m off to curl up in bed without a blogging care in the world and only about 40 more exam questions left to mark (I started with 520 ish questions to do)! I shall leave you with some beautiful Sprog spam to make you smile. Soft play…everyone’s fav right?!?! Besides the icky sweaty smell and the raving loony kids, we don’t go very much because the only time we can go is weekends and school holidays… When all the manic crazy big kids are there. No thank you! 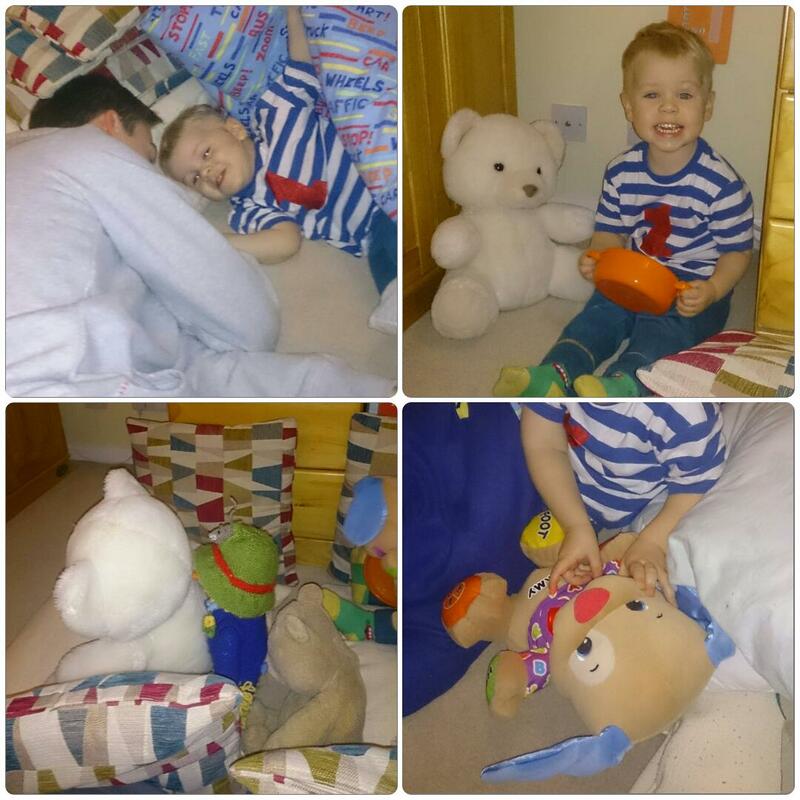 Over the last few week’s Sprog has been loving some rough and tubble play with Daddy so I thought we’d make more of an effort in creating our own kind of soft play at home… Bear with me…it turned out pretty well. Unfortunately, on the occasion that the photographed, Hubby was suffering a lot with tonsillitis and therefore mainly stayed out of the way…You’ll notice him once when he was ordered to lie under the “tent” with Sprog! This meant that our play didn’t have the vigour of a usual bean bag play session because, well I’d just worked a full day and was pretty knackered! On the positive side, Sprog took the cushions, duvet and beanbags in a more imaginative way (toddler’s don’t alway do what we’d like do they?!). 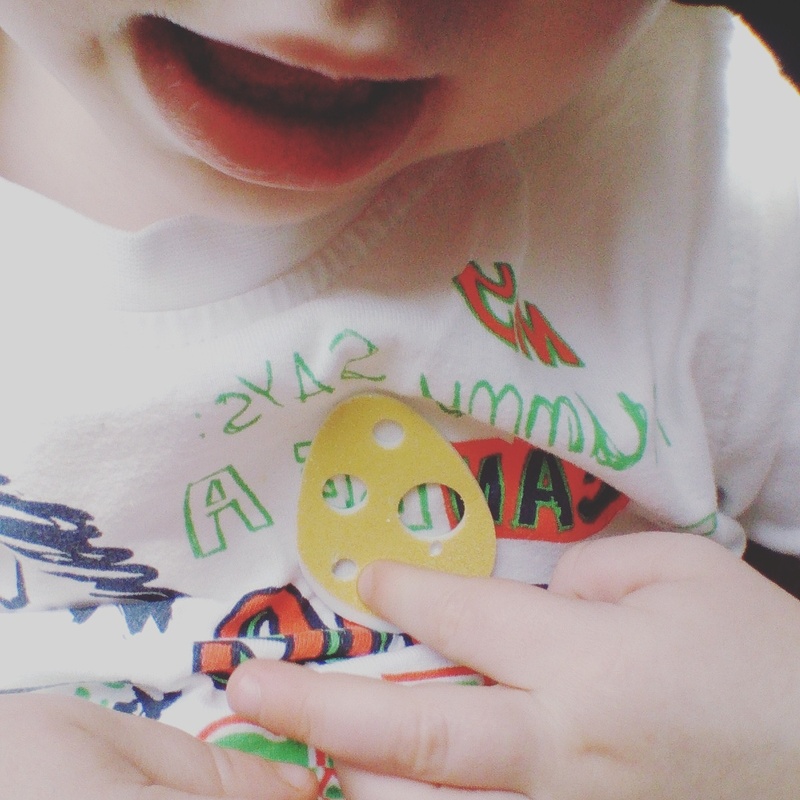 If you follow my linky, #imaginationmatters, then you’ll know just how much I blooming love it that he now does this so I didn’t force anything on him and let him go with it. As soon as Sprog saw the pile of cushions on the floor with the duvet, he requested/demanded that I made him a tent. We went back to this several times as he rebuilt the pillars of cushions and asked for the duvet to be thrown over again! 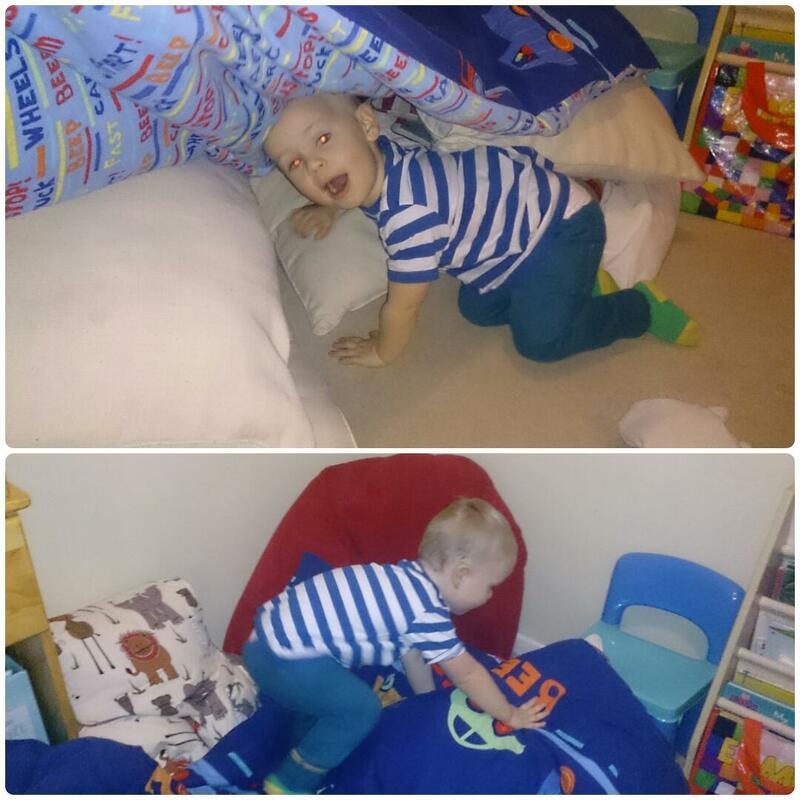 He also created a castle in several different formations and successfully managed to scale the wibbly wobbly heights of the cushions! 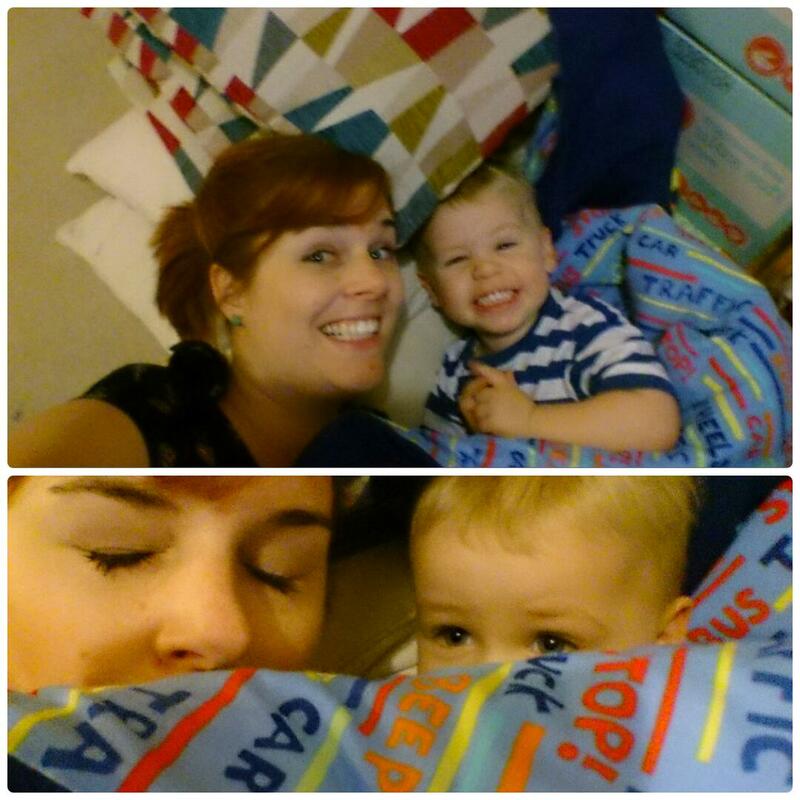 I was told to join Sprog in his tent several times and then I was told that we would pretend to go to sleep and he wanted me to take the photo. He obviously has not done that! And he obviously thought that it was hilarious that he didn’t close his eyes! Our last adventure was in to Sprog’s love of trains… Note the small square cushion doors, the cooking pot steering wheel and the many man handled soft toys! If they do come alive when we’re not here a la Toy Story (I’m becoming more and more convinced that they do), they will be talking about that for a while because he really went to town on giving them stories and different roles! So this didn’t go according to plan, but we had so much fun playing in Sprog’s room and we’ll definitely be doing again! What have you done before that did not go according to plan but was still loads of fun? 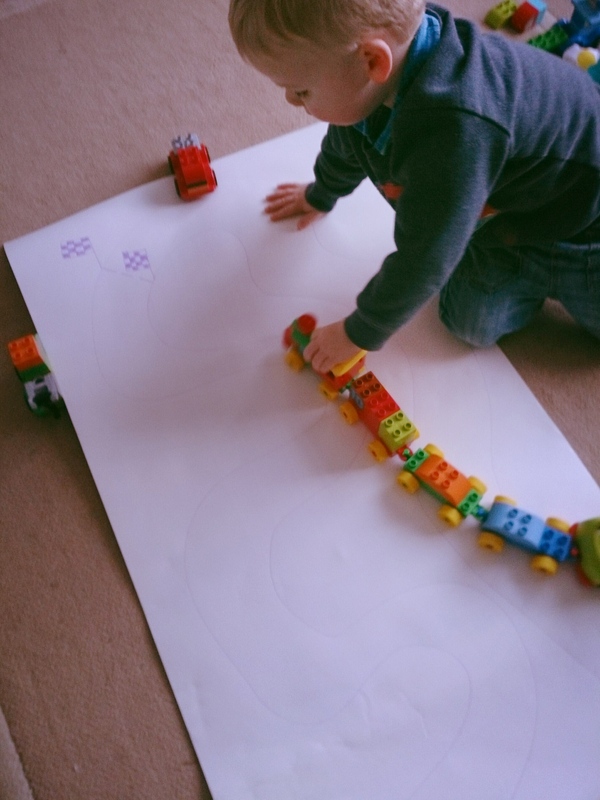 Every week we share our ideas for imaginative, creative and free play with our babies and toddlers. This linky is the place where we share them. As a full time working Mama, I have limited time with Sprog. I get the expected Mama guilt’s about not being around all of the time and not making always making the most of our time together for Sprog’s developmental benefit but I have a plan to change all of that and I want your help. 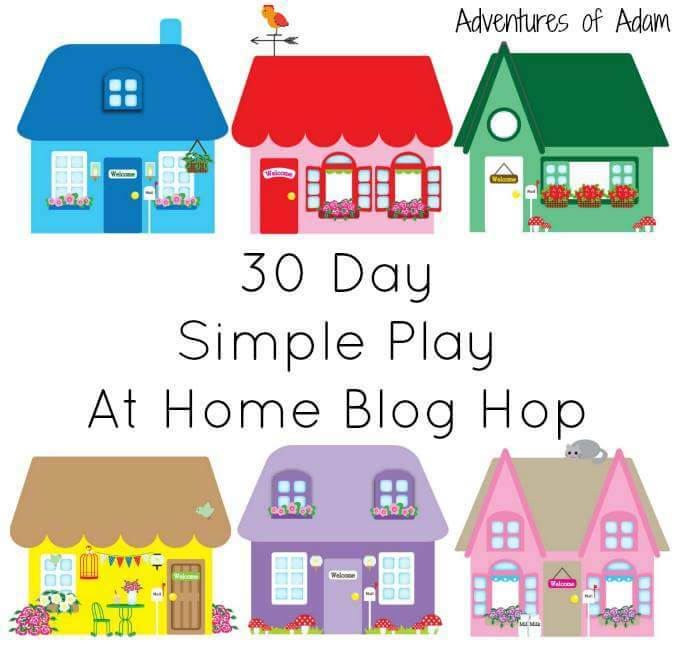 I have a prompt or theme for each week and I want your inspiration when it comes to free play, creative activities and imaginative play. 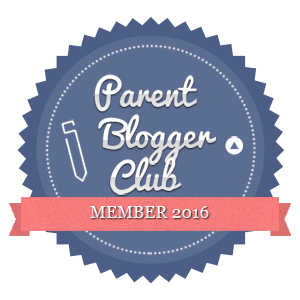 We must be a creative bunch if we able to write wonderful posts and maintain blogs but how are we sharing this with our kids? Show me your ideas? The Linky will launch every Monday and I will keep it open all week for link ups so that you have loads of opportunity to be inspired by other posts and record your amazing activities. This week the theme is “Medicine”. I’ve started us off with a bit from Doctor Sprog! 1. Link up any posts that are relevant to the week’s theme… old or new, I don’t mind. 2. Attach the Imagination Matters badge to your post. I am not technological competent, it took me a while to create this so please use it! 3. Comment on the post before yours and another one. It’s only fair that we share some imaginative love around. 4. 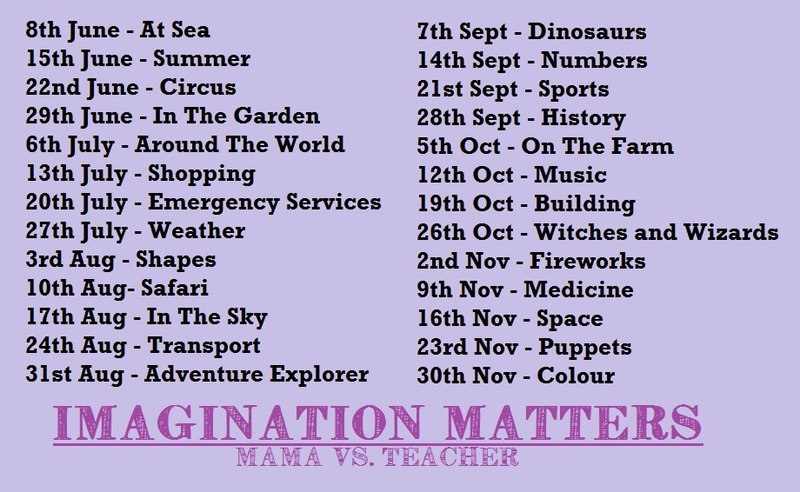 If you tweet me @mamavsteacher and use the hashtag #imaginationmatters, I will retweet them and share the creativity. I’d love to see what you’ve been up to! Doctor Sprog is in the house! One of the gifts in my goody bag from BritmumsLive in the summer was a kids magazine with some freebie toys attached. At the time Sprog was not 2 yet and I felt that they were a little small for him still. This week however, I finally cracked them out and oh my…did he love them?! The set included a stethoscope, some stickers shaped like plasters, a tube of medicine which Sprog quickly identified as being ‘cream’, a notepad and pen, along with a thermometer. I’m sure that if you don’t have these things lying around that you could compromise… How about a cardboard thermometer or a cheapy notepad from a pound shop?! 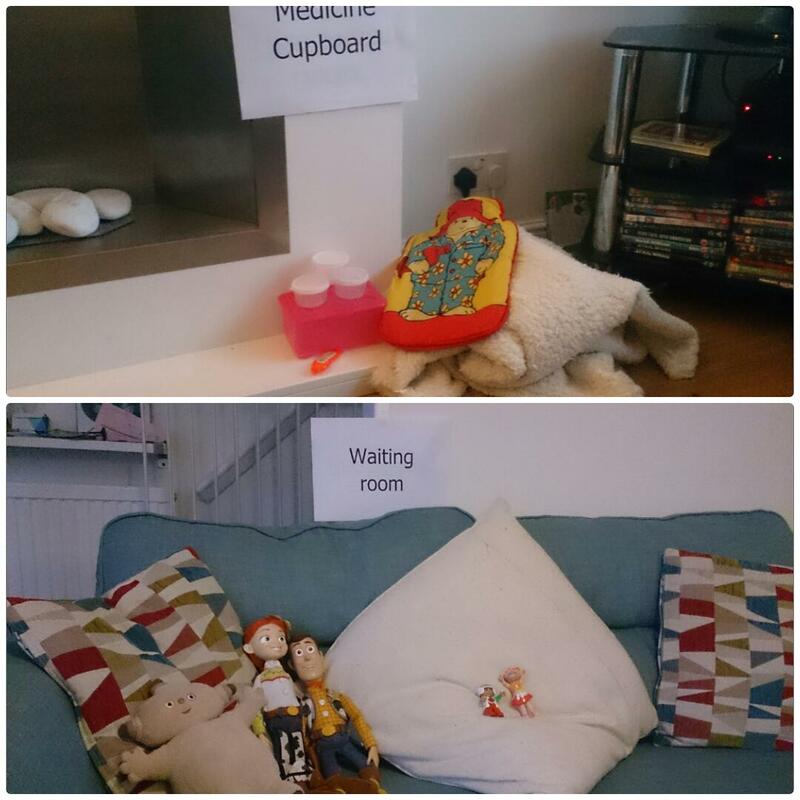 I’d managed to get home a little bit before Sprog was dropped home when I set this up for him to play and I labelled different areas of the lounge with signs saying “Medicine cupboard”, “Waiting room”, “Doctor Sprog’s room”. I didn’t even have to say much when he walked in and saw it set up with a sofa full of patients quietly waiting. His reaction was simply “Wow” before snatching up his stethoscope and getting to it. It was fabulous to see Sprog letting his imagination go crazy. 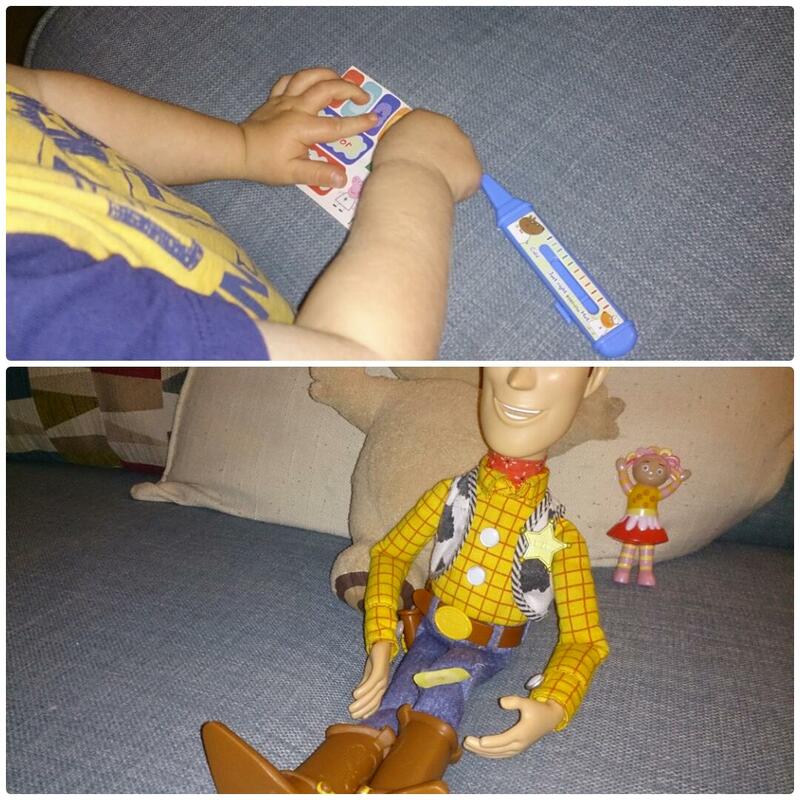 It turned out that Woody had a poorly knee which he needed a vast quantity of different colour plasters for… at one point, I did think that we might have to delve into my stash of actual plasters! He also had a temperature and was “Too hot” according to Doctor Sprog. 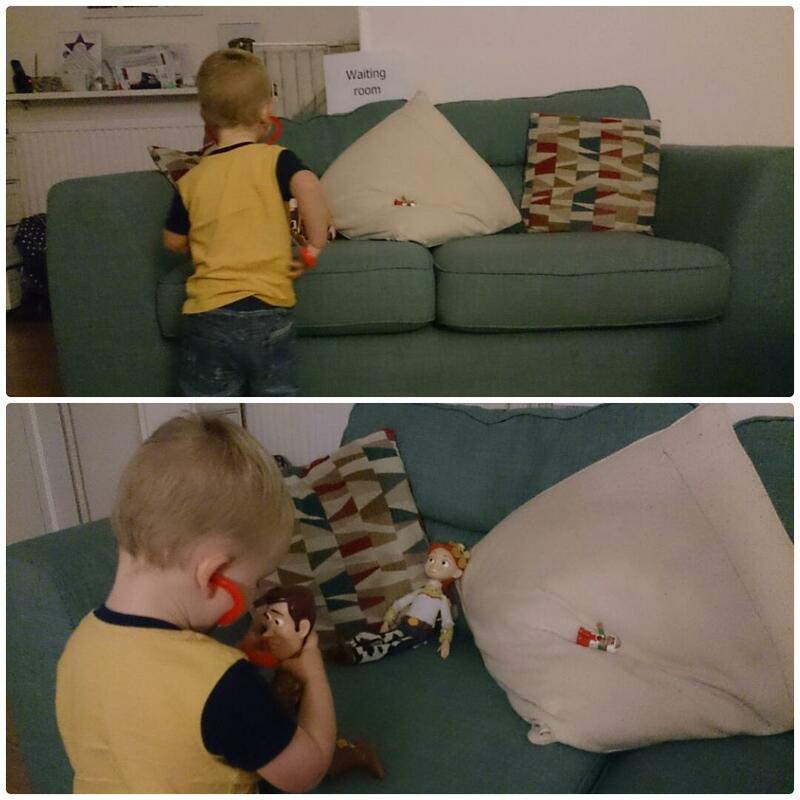 Sprog eventually turned his attentions to Makka Pakka and Jessie. It seemed that Makmak (!!!) had a poorly tummy and needed a large amount of cream applying to his tummy and then he needed to drink some. When it was Jessie’s turn, I was charged with writing Doctor Sprog’s notes for him so that he could keep them in his pink doctor tub afterwards. 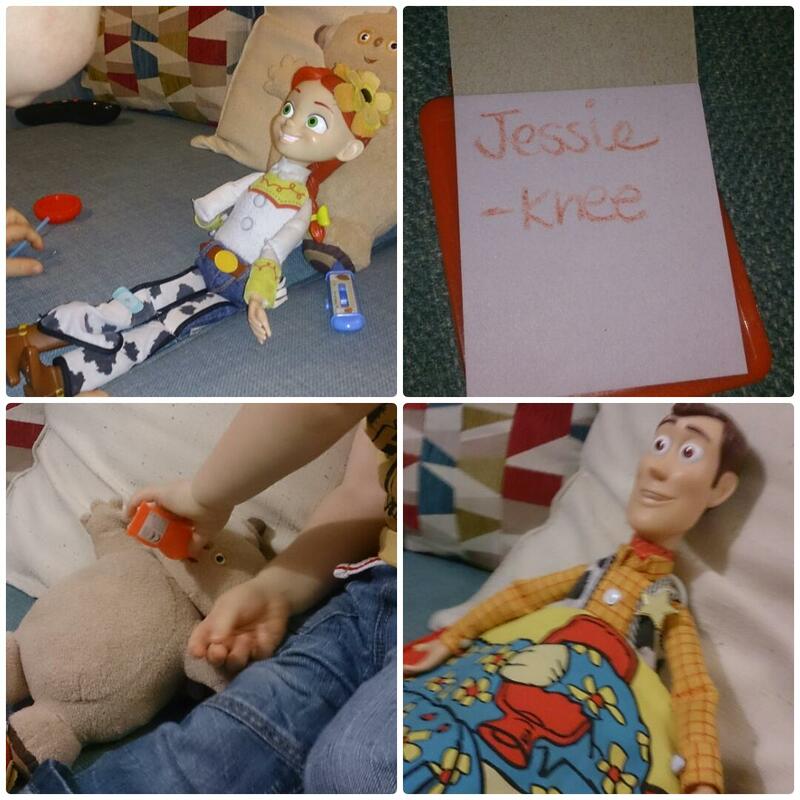 Jessie had an unfortunate accident where she’d fallen/been pushed off the sofa! After further investigation Doctor Sprog found that she too had hurt her knee… cue more plasters! I was convinced she’d hurt her face and needed a plaster there but Doctor Sprog was adamant that this was not the case! My favourite bit of this imaginative play was that Sprog led the whole session once I’d set it up and I just did want I was told! It was great to see the change in his thinking and this kind of play is what I had been craving since he was about 18 months old. Now we’re here, I blooming love it! I think it helped him that our cat had been poorly (only a couple of teeth taken out, nothing too major) recently so we’d already been using some of the vocabulary needed. I was also amazed when Hubby took Sprog to the out of doctors with him on Saturday morning. He took his stethoscope with him and as he sat down in the Doctor’s room with Hubby and he told the Doctor “My Daddy poorly” … he is genuinely making my heart burst with pride at the moment with the developments in his speech and in his ability to recognise and empathise with other people’s emotions. 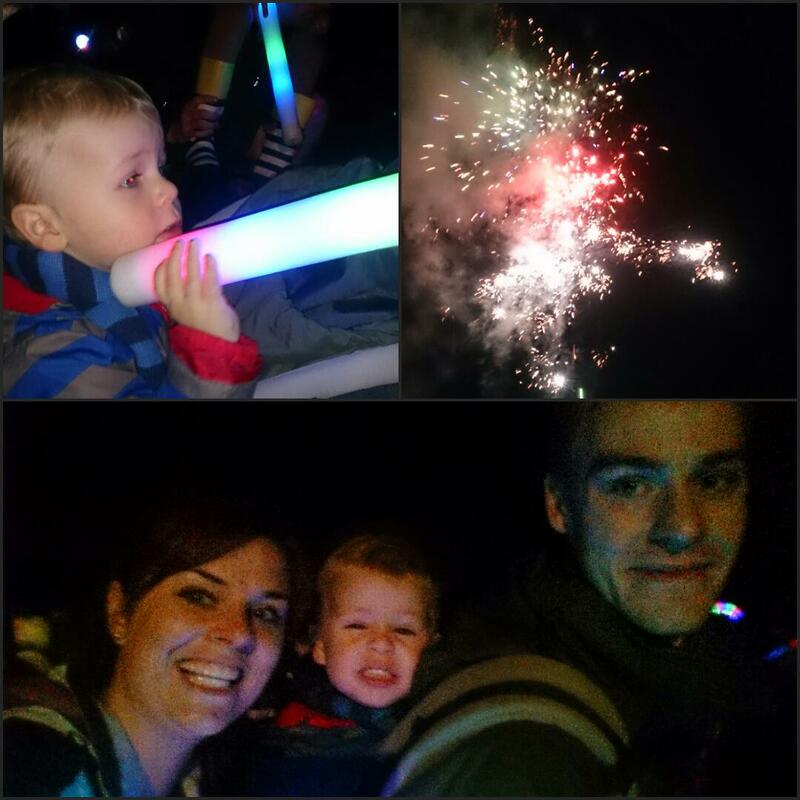 We took Sprog to see his first ever set of fireworks on Saturday evening. We pushed bed time back a bit and went for it. Since I introduced him to fireworks during half term by making these sensory paintings, he’s been obsessing over them. Obsessions are such a 2 year old thing aren’t they?! Whilst we were there I felt the all too familiar lump of pride rising to my throat. You see, my little Sprog is just adorable! I realised when we arrived that we’d left his ear defenders at home and did worry that the noise would be too much and in all honesty, I’d forgotten how loud fireworks are when you’re stood beneath a whole skyfull of them. He ended up with a mixture of us covering his ears and him doing it himself and he was in awe of the fireworks. At one point, I got told off for looking the wrong way and not paying attention to the display. I was only watching his little face light up in delight! He played with Hubby as we bought foam light up sticks, like a little jedi he swoshed and swirled around…sometimes getting very close to other people. But he held our hands when we hold him to, went in the Tula sling for a bit until he felt comfortable there and then smiled at, instead of shying away from, the other kids he saw. I was most proud of him when we got back to the car and he declared “O Mummy, people sad”. It took me a while to realise what he was saying. He was concerned that some of the children watching had been upset and crying at the fireworks. How blooming wonderful?!?! He’s noticing other people’s emotions and being concerned by them! Recently I’ve loved finding ways to relax and indulge myself a bit which don’t involve chocolate and wine (taste amazing, but stick around on my thighs for a while). I’ve been loving a wide range of different candles over the last few months but I may have found a dangerous new area in which to spend my money! I’ve never much one who has gone overboard on make up, only in the last couple of years giving in to a marginally more expensive and better quality foundation. But I may have found a range that I could get really in to. 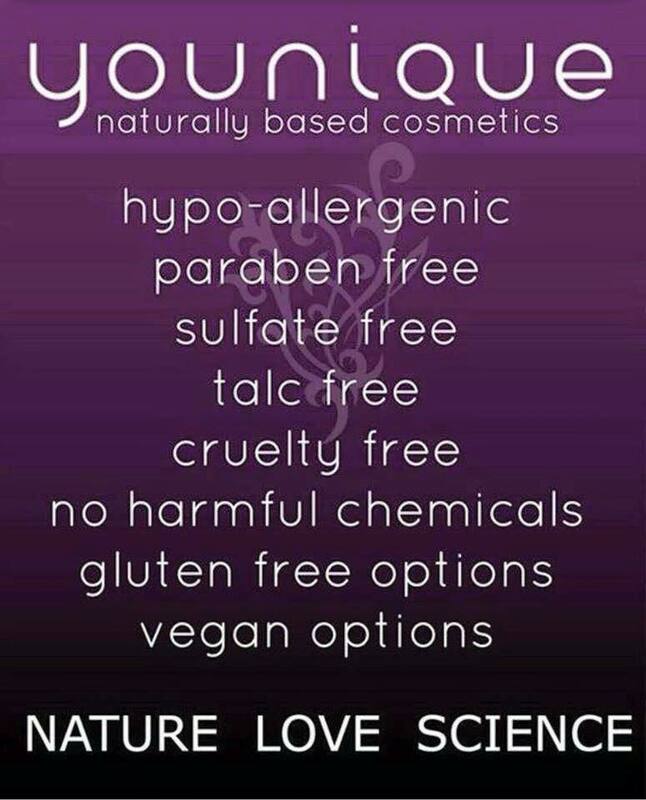 Younique products seem to be extremely well wearing, are not tested on animals and also run the Younique Foundation which a charity supporting sexually abused women. Sounds like a great start…right?! Add in one very enthusiastic and genuine colleague who in a previous life spent 10 years as a journalist with her own beauty page, is a self-confessed make-up addict and who can’t stop raving about how amazing the products are and you’ve got me thinking a bit more. 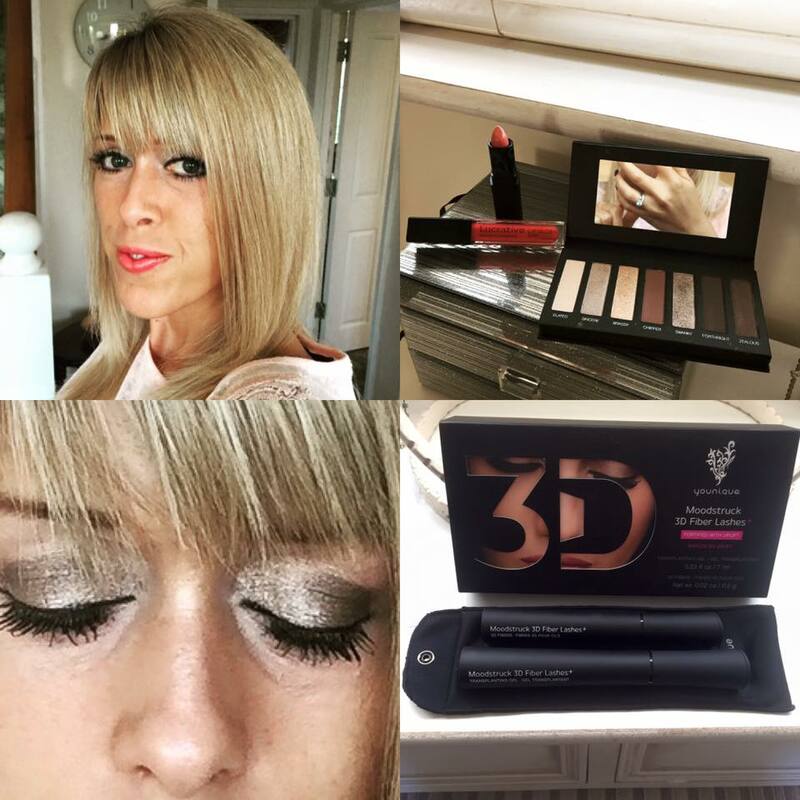 The lovely Kirsty has just launched her business page on Facebook where you can access her Younique shop to have a look at some of the wonderful products. She’s been uploading some great little tutorial video’s and is inspiring women across Worthing to look glamorous no matter what they are doing. 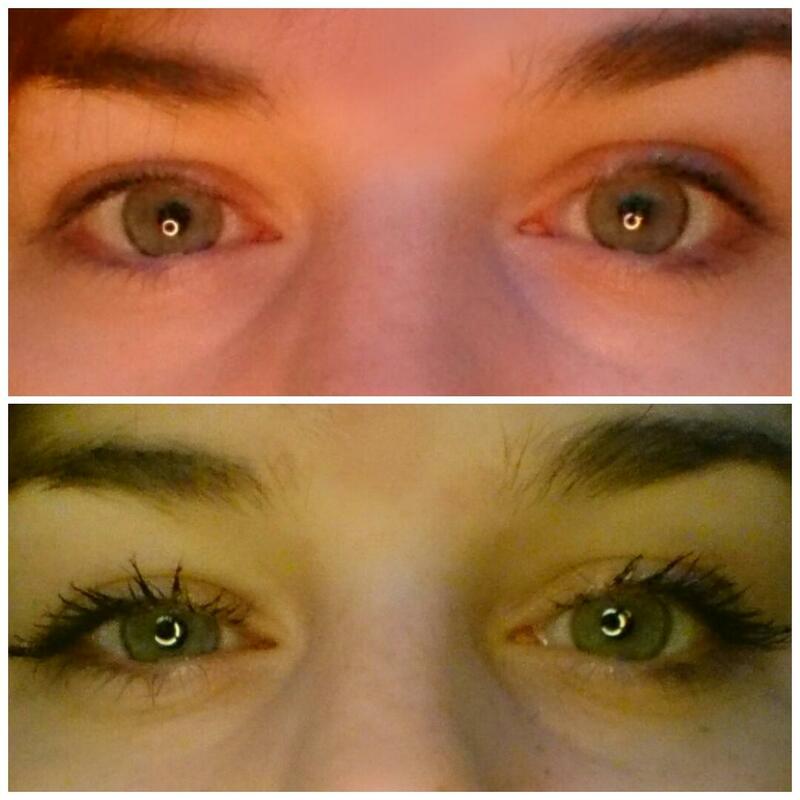 Kirsty was even more generous and has given me a ‘Magic Mascara’ to try out and holy moly is this thing good! It’s sold 1 million sets since it’s launch in the summer and I think I might already be hooked. 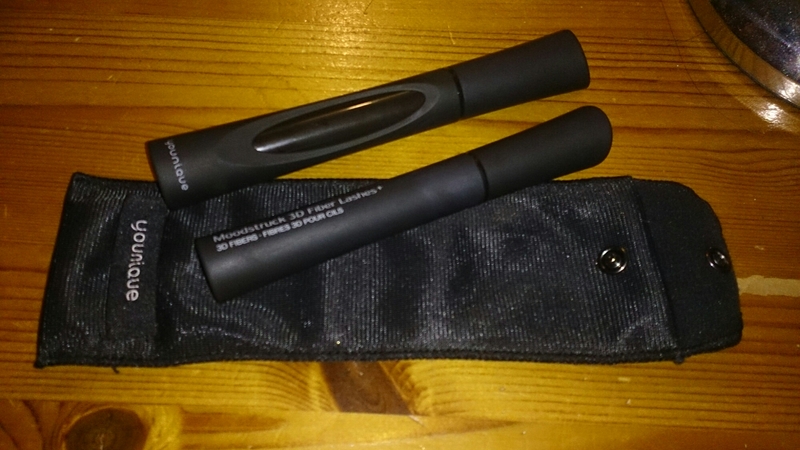 It will boost your lash volume by up to 400% and increase length without the need for fiddly falsies. 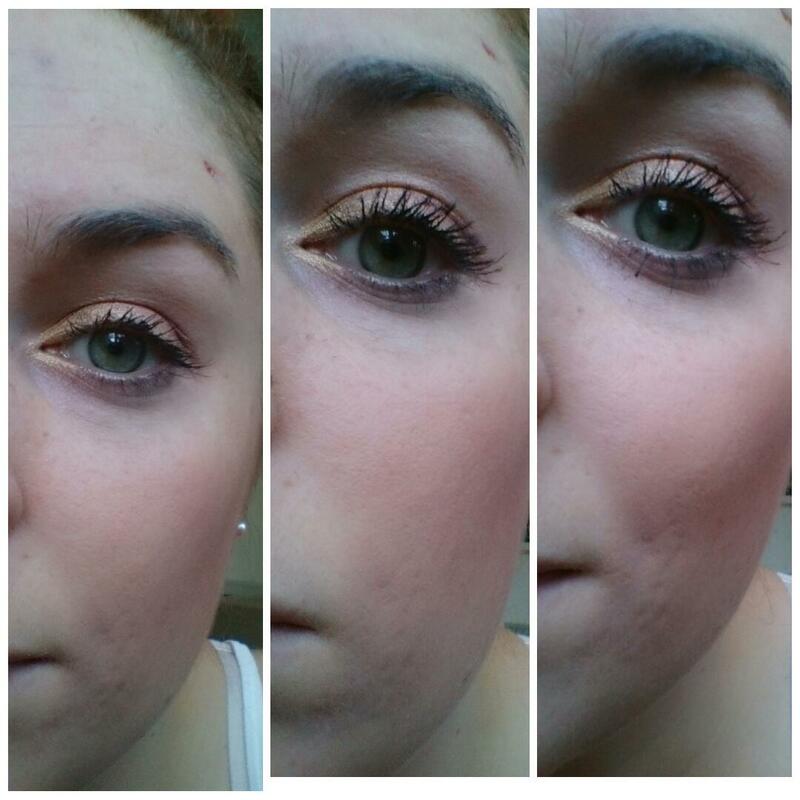 What I really want to show you is the difference in my lashes when I wear it. It’s particularly hard wearing too. I wore it on Thursday at work which turned out to be a tough day, a few tears were shed in the evening and I had rubbed my eyes in tiredness and frustrated throughout the day. My lashes?! Looked exactly the same as when I’d put them on at 6.30 a.m. Admittedly, due to the 2 different applicators to use, it does take a few minutes longer to apply than my normal one coat mascara but if you already apply more than one coat of mascara it’s probably about the same. 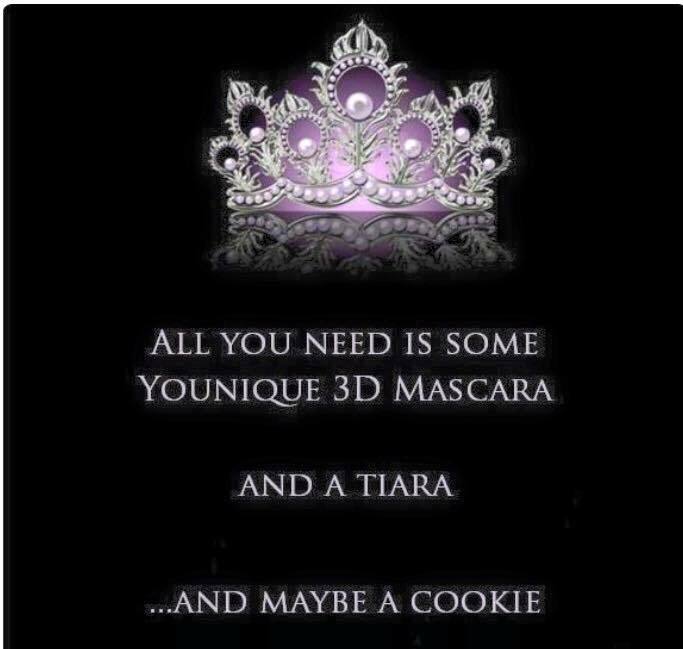 I guarantee you that it makes you feel a little bit extra special and glam as you wear it, which is quite something for the tired Mama’s and teachers of the world. I also love that there are windows on the sides of the tubes so that you can see as you are getting lower so no surprises when one morning it just stops working, not great for faking alertness! I think my next step might be to sit down with Kirsty and decide upon a whole new make up bag contents for me, one that makes me feel more like the glam goddess which is hidden so far inside at the moment. If you want to have a look at Kirsty’s site pop over to Facebook. Those of you who are based elsewhere in the country can either put orders in through Kirsty and pay the P&P to your address (free P&P for orders over £65), or order through a presenter local to you and save on the P&P. For information on other products I have reviewed visit the Review Page.